Now's the time to plan for fall foliage-viewing forays, but that doesn't necessarily mean a trip to the mountains. 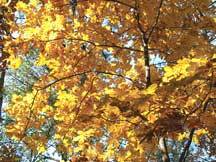 Roadsides, creek banks and even your own backyard can provide unexpected bursts of fall color. Ask most people about places to see fall color other than the mountains, and you may receive no response at all or a very brief one. We have become so accustomed to viewing hundreds of acres of autumn scenery in a single glance on a mountainside that we can easily overlook the closer, smaller, more local bursts of fall color. Maybe we need to take a new look at finding fall color nearby, in the unexpected places where many of our native plants thrive. I grew up in the Lowcountry where there are no mountain vistas, but my family nonetheless enjoyed the autumn changes along the roadsides, along creeks when fishing, and around fields, while hunting quail, doves, squirrels and deer. Nowadays, during spring and summer hikes, my wife and I notice the trees and shrubs - still green - that will change to beautiful hues in fall. Visiting the rocky shoals spider lilies at Landsford Canal State Park on the Catawba River at the end of May, for instance, we often notice painted buckeyes and mature hickories like bitternut and shagbark along the nature trail. We plan our return, camera in hand, to catch the autumn show on both banks of the river. 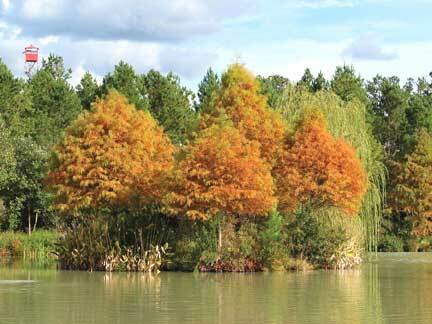 The South Carolina coastal plain also offers autumn views, but often they're closer to the ground. Scout for wildflowers like liatris, beardtongues and asters and low shrubs like dwarf huckleberry when driving through Francis Marion National Forest, advises John Brubacker, of Charleston, chairman of the issues committee of The S.C. Native Plant Society. One of the best fall leaf displays in his recollection was on the shore of Lake Marion at Eutaw Springs near the battlefield site, where maples, hackberry, oaks and muhly grass joined the scenic choir. Touches of good fall color can be seen almost anywhere in the Lowcountry, according to S.C. Department of Natural Resources nongame biologist Billy McCord, who works from the Marine Resources Center on James Island in Charleston. "Virginia glasswort makes quite a show when colonies on salt flats turn reddish-purple in fall, not necessarily in the same place every year since the plant is an annual. In some years, there is a gorgeous fall colony along Harbor View Road (north side) on James Island between Ellis Creek bridge and the James Island connector," says McCord. "I also get to see a nice fall display of pignut hickory with touches of poison ivy and Virginia creeper along Fort Johnson Road, very near Fort Johnson itself, so I enjoy pretty colors every workday in fall!" For beyond-the-mountains fall color expeditions in the Midlands, several areas come highly recommended. Peachtree Rock Heritage Preserve in Lexington County offers walking trail routes through dry and wet sandhill habitats. Plan to see its best color display in late fall, with the scrub oaks like turkey, blackjack and bluejack and shrubs like maple-leaf viburnum, sweet pepperbush and deciduous lyonia adding to a show completed by the bloom of fall wildflowers like goldenrod and sticky foxglove. The viewing platform at Congaree Bluffs Heritage Preserve in Calhoun County affords a vista of tree-filled swamplands along the Congaree River and across the river in the Congaree National Park. A nature trail at the base of a steep bluff near the river affords a close-up view of native trees, shrubs and herbs. Abundant fall wildflowers, many of them shade-loving, can also be seen on the preserve's other nature trails. 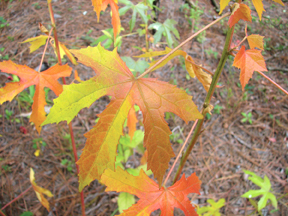 Within Congaree National Park itself, autumn color can often be found in the sunnier, more open areas like sloughs and wood edges. The paved riverwalk trails along the Congaree, Saluda and Broad rivers in Columbia, Cayce and West Columbia offer broad vistas of trees changing color on the opposite banks, as well as close-up views of wildflowers and the autumn leaves of black locust, tulip poplar and sycamore. Two abundant riverbank trees, the box elder - a type of maple - and the large-leaved pawpaw, will have striking yellow fall leaves given sufficient sun. Farther north, try Kings Mountain State Park in York County, Stevens Creek Heritage Preserve in McCormick County or Forty Acre Rock Heritage Preserve in Lancaster County. 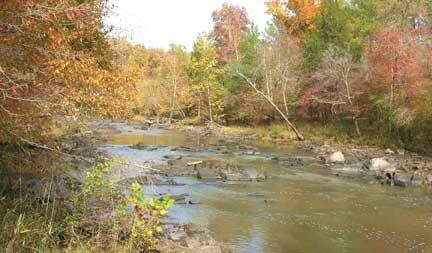 In the Pee Dee region, Segars-McKinnon Heritage Preserve and the adjacent Kalmia Gardens near Hartsville or Lynchburg Savannah Heritage Preserve in Lee County provide excellent fall color-viewing opportunities, as does Savannah River Bluffs Heritage Preserve in Aiken County. 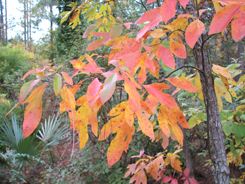 Throughout South Carolina, sourwood trees are often the first to display fall color, many showing red in summer before the entire tree lights up for autumn. Sometimes called the summer sorrel tree, this species' small creamy flowers provide honeybees with the raw material for a clear, flavorful honey. Sourwood grows naturally in all forty-six counties. Other best-of-show tree species for fall include hickories, hawthorns, viburnums, many oaks, black gum, American beech, birches, flowering dogwood, maples, sweet gum, catalpa, sassafras, red mulberry, elm, ash, black walnut, persimmon, sycamore, black and honey locust, bald and pond cypress, serviceberry, redbud, basswood, black cherry, wild plum, buckeyes, greybeard trees, pawpaw, deciduous hollies and crab-apple. A great way to prospect for future fall color viewing expeditions is to read descriptions of natural areas in South Carolina, particularly plant species lists. The Internet provides a wealth of references, including the S.C. DNR's managed-lands Web site at www.dnr.sc.gov (follow the "Public Lands" link on the left side of the page). The S.C. Department of Parks, Recreation and Tourism also has several Web pages devoted to fall foliage, including weekly updates to help plan your viewing trips, a discussion of the natural science behind fall color, a "best viewing locations" guide to state parks and even a live Webcam from Table Rock State Park. Visit southcarolinaparks.com. 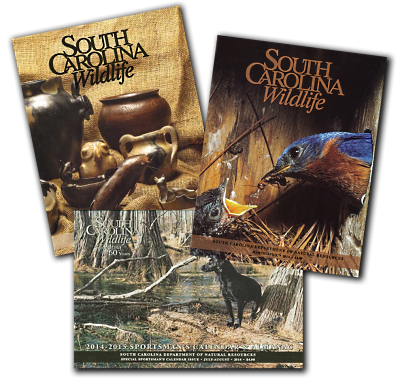 One of the most popular printed guides to natural areas in South Carolina is the 112-page South Carolina Nature Viewing Guide. Areas in the paperback are arranged by region: Mountains, Piedmont, Sandhills and Coastal Plain. 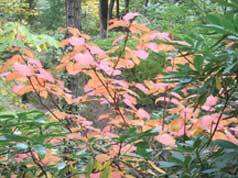 Dogwoods, persimmons and hawthorns may have vivid fruits to accent their brightly hued leaves. The rich yellow-to-bronze ribbed leaves of American beech will stay attached until spring, fading to light tan. A cousin of magnolias, the tulip poplar is always light golden-yellow and readily recognizable with its tulip-shaped leaves. Watch out, too, for shrubs and vines with good fall color potential. 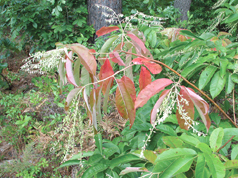 These include all the blueberries (cultivated Rabbiteye varieties too); all sumac species; stoloniferous viburnums; huckleberries (distinguished by golden resin dots under the leaf); supplejack vine; climbing hydrangea; Virginia creeper; poison ivy and oak; sweet pepperbush; Virginia sweetspire; American beauty-berry; sumacs; witch hazel; muscadine grape; chinquapin; running shadbush; dwarf witch alder; sweet shrub; all eight species of native azaleas with their yellow, red and orange leaves and large buds; and the spiny colonial Hercules'-club with its near-white leaves and clusters of blue-black berries. The opposite-leaved possum haw at water's edge presents large clusters of red, white and blue-black berries. Running shadbushes can provide a show of orange leaves and tasty berries, if you beat the birds to them. Don't overlook the fall color provided by native herbaceous plants either, whether they are blooming late or changing leaf color to prepare for winter. Grasses and sedges may turn to gold and reddish tones. Drying stems of blue star, false indigo, herbaceous smilax and wild yam can be painted gold for fall. Cinnamon and bracken ferns take on gilded hues and light up the forest floor. Spectacular shows of bloom may appear in old fields, along utility rights of way, in dry sandhills, across open pinelands, hiding in bogs or floating on mats in Lowcountry rivers, and in the depths of swamps. Every site has a season of show, some several. When a trip to the mountains seems a little too far, or the price of gas too high, pursue the stars of a South Carolina autumn closer to your home in places like public natural areas, parks or even your own backyard. Home may be just the place to start a fall color safari. Learning the species at your back door will be your guide afield, and the closer and more often you look, the more you will find. Longtime SCW magazine contributor Mike Creel is an expert in the propagation of South Carolina native plants and wild azaleas.